Genkent - 1 tongue cleaner for oral health. Made from stainless steel because it's impervious to bacteria and far more durable and long lasting than plastic. Narrow blade design and comfortable grip handles allow for easier use and full coverage of tongue. Long lasting - pre-curved stainless steel blade is flexible, durable, and gentle on tongue - Ideal for kids and adults. Gently removes bacteria - narrow blade design ensures full coverage of tongue - More effective than a tongue cleaner brush or plastic tongue cleaner. Antibacterial comfort grip - for easy use and handling - No disgusting rubber grips that get moldy! Stainless steel is easy to clean up, durable, flexible, and more effective than plastic tongue brushes. 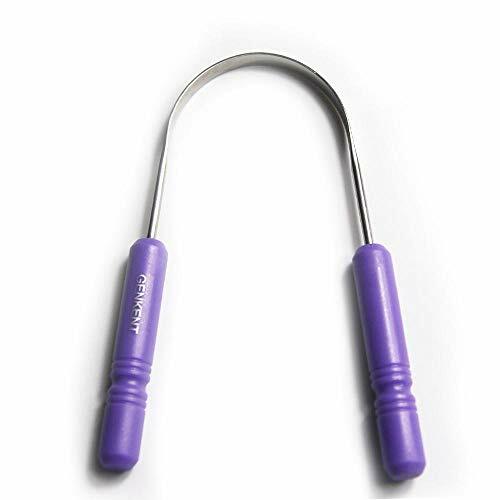 Stainless Steel Tongue Cleaner Scraper Limpiador de lengua - Eliminates Bad Breath Halitosis Colors may vary - Surgical Grade Antibacterial Steel - . No. Great value for such a small price! why choose a stainless steel tongue cleaner?more thorough cleaning than a traditional toothbrushgently removes mucus-based layer of debris of tongueHelps eliminate dry mouth and bad breath causing bacteriaPromotes a healthy balance of oral microbesDurable, effective, and easy to clean up after each useSurprisingly satisfying!How to use a tongue scraper?Grip scraper by both handles in both handsReach the scraper to the back of your tongueGently scrape it toward the front of your tongueRise off any residue Yuk! from the scraperRepeat 4 to 5 timesAnd remember to be gentle! High-quality medical grade stainless steel - Non-toxic and impervious to bacteria. Effective treatment against bad breath, dry mouth, and to restore taste sensation. Soft blunt edges are gentle on tongue, making it ideal for children and adults.